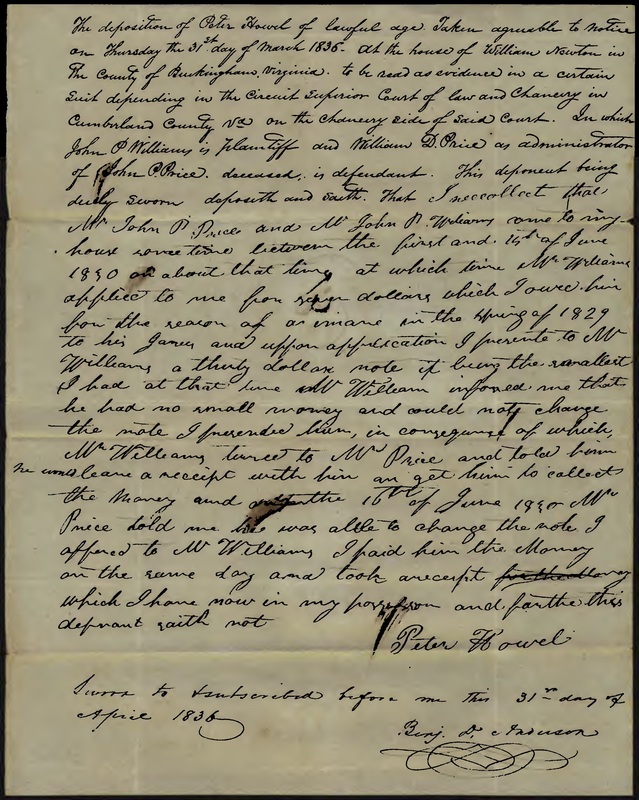 Finding records for ancestors in antebellum Virginia are always a treasure. One of my favorite record sets is the Chancery Records Index available through Virginia Memory, Library of Virginia. Although it says it is an index, it is much more. Not only does it provide a search capability of an index, once you find a record you may also download the original document images. They even provide a batch download of all the images in a set as a ZIP file instead of needing to download all the files one at a time – A very handy feature when a record has 90 images. I was recently looking for records regarding my wife’s 4th great-grandfather John Price and looked at the Virginia Chancery Records Index for possible information. Sure enough, a search for anyone with the surname Price being the plaintiff in a case between 1779 (when John was 21 years old) and 1840 (a few years after his death). There were 11 records returned and four of them related to a John Price as the plaintiff. A similar search for Price being the defendant returned 12 records with three of the results relating to the administrator of John Price’s estate being the defendant. With these records, I thought I’d look at the details of the John Price cases to see what might be there. Woo-hoo! One of the cases includes testimony from Peter Howell, whom I have been searching for information regarding for quite some time. Would his affidavit show anything new? Here is my transcript of the document. to his Hames and upon appreciation I present to Mr.
the money and after the 16th of June 1830 Mr.
John P Price and John P Williams came to Peter Howel’s home in June 1830. Peter Howell testified (was living) on 31 March 1836. William Newton lived in Buckingham County in March 1836. William D. Price was the administrator of the estate of John P. Price. Peter’s deposition doesn’t provide any important new information regarding him or his life. However, there are 90 pages within this Chancery case, and the Peter Howell deposition only provides two of those pages. There is a lot more to look at and see what I can learn. There is a deposition from a “William Holman.” I’ll bet this is the William Holman that married Peter Howell’s half-sister? If so, maybe that will provide fresh new areas of inquiry. There are also several other documents in Virginia Memories Chancery Records that should be reviewed closely. Ninety pages of transcribing hard-to-read 19th-century handwriting is always a chore (for me), but it has the potential of opening new areas of research. There are some 23 Chancery cases from Cumberland County, Virginia, that might apply to my wife’s Price ancestors; I need to review them and glean any new facts I can find. Use Virginia Memory Chancery Records Index to look for Virginia ancestors who lived in Virginia between 1750 and 1912. Be sure to check by specific county and/or city to your research processes to avoid searching for information from counties not covered by the index.